David Robins, Creative Foundations, received the Lifetime of Giving Award for Outstanding Advocate Tuesday from the Delaware County Board of Developmental Disabilities. When Robins name was announced, the cheers went up from the Creative Foundation group. 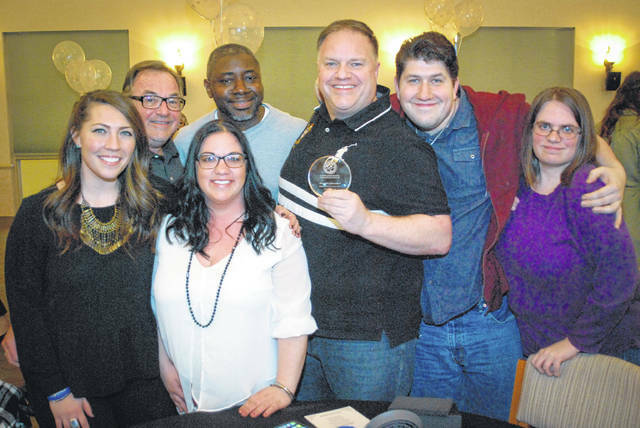 Pictured, left to right, are front row: Kelly Jacoby, Andrian Marshall, David Robins, Paul Day and Angie Alatorre; back row: Michael Hite and Musa Suma. Delaware County Board of Developmental Disabilities held the Lifetime of Giving Awards Tuesday to honor the outstanding self-advocates, service professionals, and others who support individuals with developmental disabilities. The award winners could be nominated by anyone in the community. Superintendent Kristine Hodge, Delaware County Board of Developmental Disabilities, introduced this month’s theme, #JustAskMe. She said the theme was the inspiration of Rachel, an individual the board serves and featured in a story by Anne Miller, communications coordinator for the board. Back in 1987, former President Ronald Reagan declared March as National Developmental Disabilities Awareness Month. Hodge said last year the board celebrated 50 years of service in Delaware County. She said over the year the board celebrated with different events with one becoming a milestone. During the ceremony on Tuesday, Board President Louis M. Borowicz said he was “incredibly proud” to serve the county as a DCBDD member. Borowicz provided a history of the awards. Borowicz said that eight different awards are given to honor people, professionals, employers and community partners for their work and volunteerism that exceeds expectations. Bryant, Bayer and Wheeler, the recipients of the Outstanding Community Partners Award, were nominated by the parents of Alex Kearns, a boy who receives services from DCBDD. Bryant, Bayer and Wheeler’s story begins when Alex went to his parents with a note from school asking to play soccer. Bryant said they put on a huge soccer camp every year. On the first day at the field, Alex wasn’t sure if playing soccer was what he really wanted to do. Nick Wheeler, a coach, said the number one thing he learned by having Alex on the team was how important inclusion was, “not just for Alex, but for the high schools” as well that Alex participated with. As for Alex, he said he felt “good” and that it was “awesome” for his coaches to receive the award. This entry was tagged Creative Foundations, D. Anthony Botkin, Delaware County Board Developmental Disabilities, March. Bookmark the permalink.